The Commissioners from Central Mason Fire & EMS, Mason County Fire District 6 and Mason County Fire District 11 signed a collaborative services agreement Thursday night. Under this agreement, Fire District 6 (which serves the Union area) and Fire District 11 (which serves the Island Lake area) will still operate their departments as they have in the past but are now members of Central Mason Fire & EMS. The agreement also establishes a Joint Executive Committee consisting of each Fire Department’s Chief (Tim McKern from Central Mason; Barndon Searles from District 11; and Clint Volk from District 6) and Central Mason’s Deputy Chief Mike Patti. McKern will be the Chairman of the Committee while voting members are Searles, Volk and Patti. Any business of this Committee must be approved by each Districts Board of Commissioners and nothing can go forward without approval of the Committee. Other benefits of the service agreement include a Joint Fire Investigation Task Force which will standardize fire investigation methods and training, and add depth to the pool of investigators; Collaborative Fleet Maintenance and Repair Program – Central Mason will make their staff mechanics available to Mason 11 and Mason 6; and Collaborative Emergency Services Training Program – offering standardized training programs and offering them to all districts. 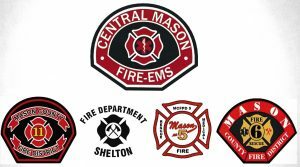 Other Fire District can join this collaborative effort and become part of what is being called “The Central Mason Fire Family.” Central Mason Fire & EMS already includes Mason County Fire District 5 and the Shelton Fire Department (the City of Shelton contracts with Mason 5 for fire and EMS services). The agreement became effective Thursday night after the Mason 11 Commissioners authorized signing it. Central Mason Commissioners took action on the agreement last month while Mason 6 Commissioners authorized the signatures earlier in the week. The three commissions will hold joint meetings twice a year with the first meeting scheduled for 7 PM January 9, 2017. Each Commission Chair will meet with the Joint Executive Committee on a quarterly basis.